When drains and sewer lines backup in Pontiac Michigan it can be very frustrating. There are many different reasons for drain clogs. Roots, grease, feminine products, hair and soap buildup are some of the main contributors to causing plumbing clogs in Pontiac. Our drain cleaning specialists in Pontiac Michigan can clear anything blocking your drains and get your water running like normal. Our Pontiac plumbing and drain cleaning technicians are highly trained to handle all of your plumbing emergencies and needs, 7 Days a week with never a hidden extra charge. 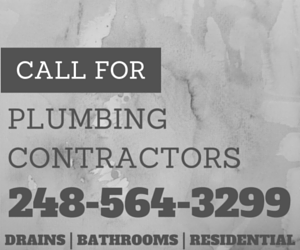 We are your number one place in Pontiac Michigan for all your plumbing and drain cleaning needs. We even clean septic tanks and fix hot water heater in Pontiac Michigan. Call us so we can service your home today! Ask a $99 drain cleaning specialist about our No Cost, No Obligation Preventative Maintenance Inspection. Call 248-564-3299 for a FREE Estimate.